I'm sure your barbecue grill is out waiting to be used for the next barbecue lunch. It can be too hot sometimes to turn it on but grilling goes with summer and it's one of the best things about this season. We cook outside with the slight breeze of summer and the food we eat is lighter. When we have barbecue parties, whatever the theme is, seafood or meat, we never forget the vegetables on the side. Grilled with no condiments at all then drizzled with extra virgin olive oil with good quality is the perfect Italian vegetable side dish. It's the best way you can treat your vegetables. You will love them I'm sure. 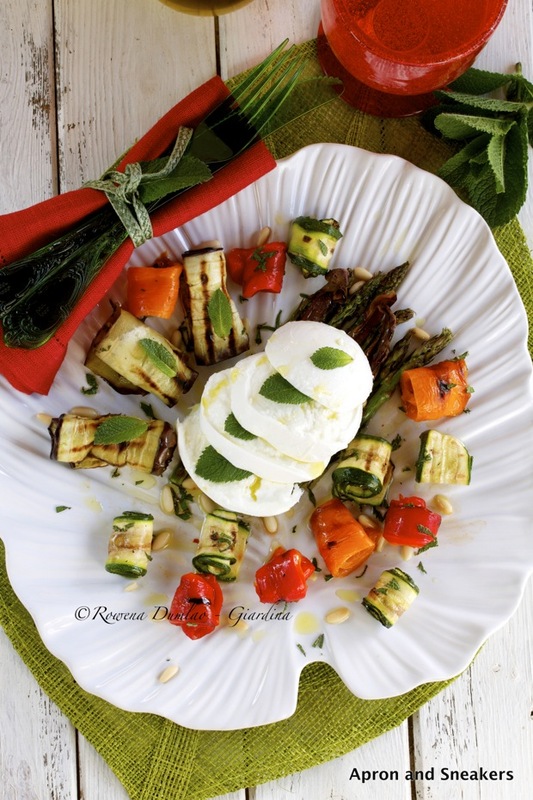 Here is a grilled version with an addition of pine nuts and mint to spruce up the flavor just a little bit. And to love it more, fresh mozzarella will do the trick! You'll still enjoy the barbecued hints of the veggies without any overpowering taste. My recipe for this can be seen at SheKnows.com where I create recipes. Click on this link to get there. If you are curious to know the other recipes I have created for them, please click on this link too. Thanks and have a wonderful, sunny summer day! Let's just hope it's not too hot!